Regular asphalt maintenance is extremely important in preserving your asphalt and protecting your parking lot paving investment. 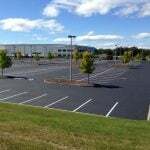 Parking lot striping, or line striping is one of these extremely important asphalt maintenance and repair items. You should be re-striping your parking lot at least every other year. There are several reasons why regular updating of pavement markings is so important. Parking lot striping is used for traffic coordinating purposes that help to create safety for both pedestrians and drivers. 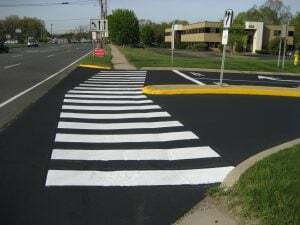 Well-defined crosswalks help to ensure that drivers and pedestrians watch out for each other, and help drivers to know what areas to slow down at to watch for pedestrians. Pavement markings also help to direct traffic flow and to assist drivers in how to properly move through a lot. Markings that are warn and fading are harder to see, making it easier for accidents to occur. When it comes to commercial parking lots, you want traffic to flow quickly, safely, and efficiently. Regular re-striping helps to ensure that this is the case. Have you ever been to a parking lot where pavement markings were not visible? If you have, chances are you also noticed that cars within this lot were parked inaccurately and haphazardly. Bright and clearly marked spots help to allow for the maximum number of cars and trucks to be parked in your lot at once. Clearly marked parking spaces and traffic marking also helps to ensure that vehicles are not parking illegally and/or in unsafe areas, helping to avoid congestion and damages. It’s no secret that well-maintained properties look better, and are more inviting. A parking lot full of potholes, cracks, fading, and barely-there markings is an indication of neglect. Your parking lot it your customers’ first impression of your business. If you are neglecting your parking lot, are you also neglecting your business and customer service? Additionally, if driving in and parking in your lot is a headache or challenging, it could be enough to leave visitors feeling like they do not want to come back, resulting in lost business and money. Keeping your parking lot and its markings fresh, clean, and well-maintained helps increase curb appeal and drive continued business. 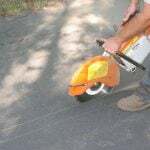 Additionally, regular sealcoating is another important asphalt maintenance item that helps to increase your property’s curb appeal, while also helping to protect it. ADA regulations is one of the biggest reasons why up-to-date parking lot striping is so important. 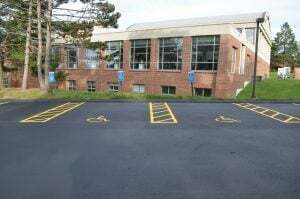 There is an extensive amount of ADA regulations that must legally be met for your parking lot to be within compliance. Your paving professional should be well versed in all of these regulations in all areas that they service. You will need to consider size of accessible spots, number of accessible spots, van-accessibility, location of accessible spots, signage (painted and physical sign), sidewalk regulations and markings, route created, etc. Ignoring, or not understanding these regulations fully can result in ADA lawsuits. All ADA markings and spaces need to be clear and visible. Maybe you followed all of the ADA regulations when you had your parking lot striping done 5 years ago, but if you haven’t had them re-striped since, you may now be out of compliance (no longer visible, or there may have been adjustments to ADA regulations since then). Properly directed traffic flow and ADA accessible accommodations ensure safety and compliance. 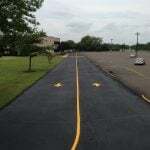 EastCoat Pavement Services is equipped to handle any re-striping job or establish a new parking lot striping layout design that works best for your commercial property. 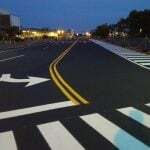 Let us help formulate a line striping maintenance plan that is best for you and your property’s needs! Did you know that we also can help with your running tracks, tennis courts, and playground striping needs? Contact us today for you free consultation!